Contractors will begin the installation of construction fencing at the site for the new Physics and Astronomy, Interdisciplinary Sciences (PAIS) building on Friday, Aug. 11, 2017. It is anticipated the fencing will stay in place for the duration of the project, which is scheduled for completion in 2019. Because of the fencing, Redondo Road through this area will be restricted to two lanes. 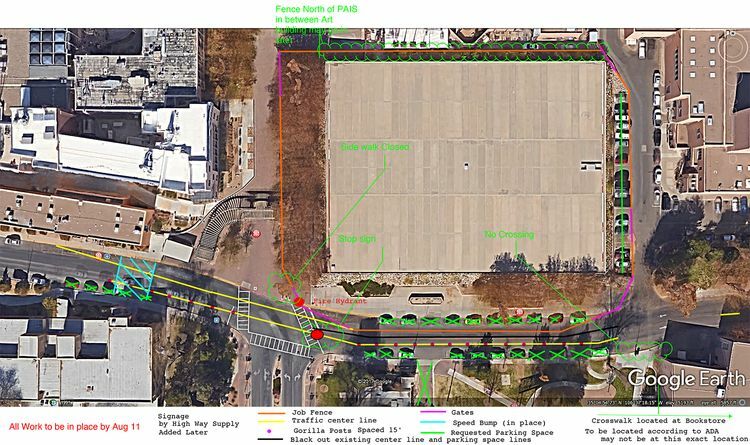 A sketch has been provided to indicate where the fence line will be, and its impact to traffic, parking, pedestrian walkways and crosswalks. Please use caution when driving and walking through this area. Pedestrians are advised to use the crosswalks located at Yale Blvd. and Redondo Road for safety purposes. If you have questions about this project, please contact Michael Reid, group manager with Planning, Design, & Construction at 505-220-6256.